Oh Biltmore. Our time has come to an end. With the expiration of my annual pass approaching, my adventures at the Biltmore will be ceasing. And at the price of an annual pass, I doubt it will be something I will renew. Over the course of my year, I was able to visit the Biltmore three times. I wish I would have been able to go 4 or 5 times but at least at three I was still able to make the pass worth it. And if I had lived in Asheville, I know I would have gone more frequently. If just to take advantage of their various walking, biking, and hiking trails. To kickoff my last visit to the Biltmore, I hit up the winery first. 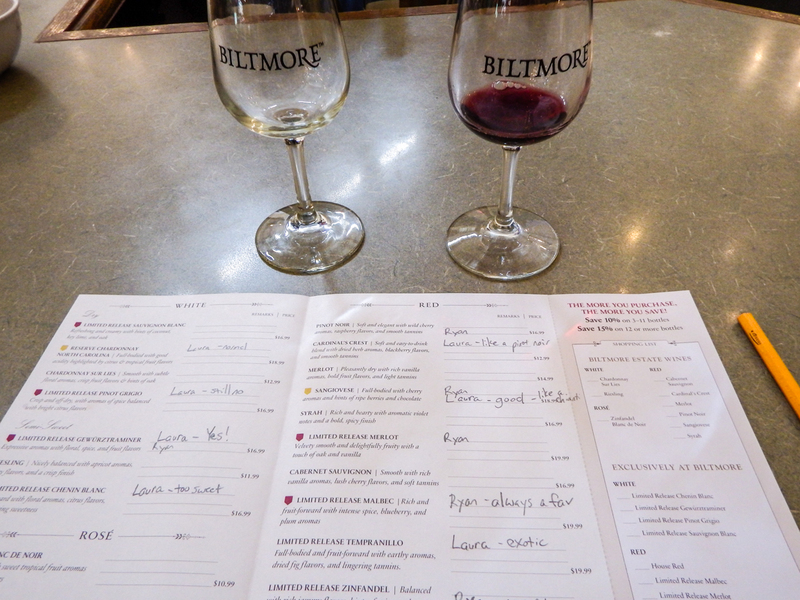 As I’ve recounted before, I love the Biltmore winery. 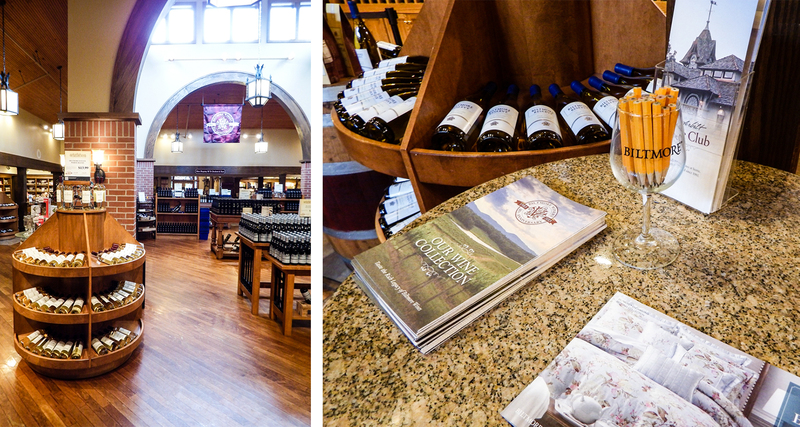 The tasting and winery visit is included in the admission to Biltmore, so as a passholder this year, I made sure to hit it up on every visit. I also followed my previous advice and headed to the winery first. 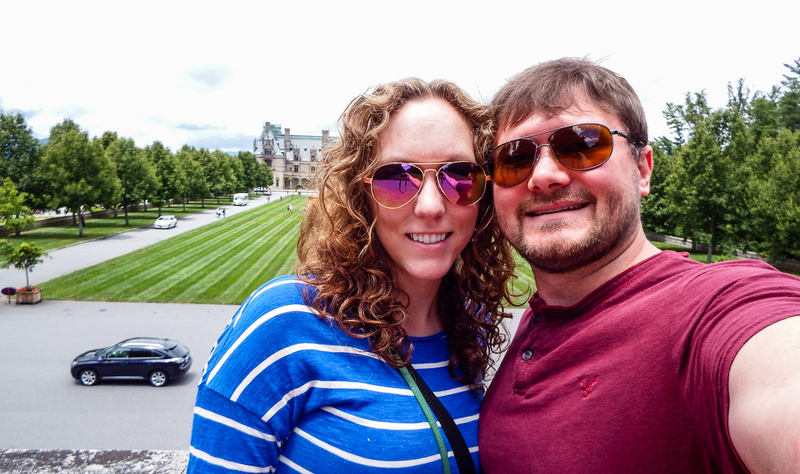 We arrived at the Biltmore at around 10:30am and ambled around the Antler Hill Village for 30 minutes until the winery opened at 11am. 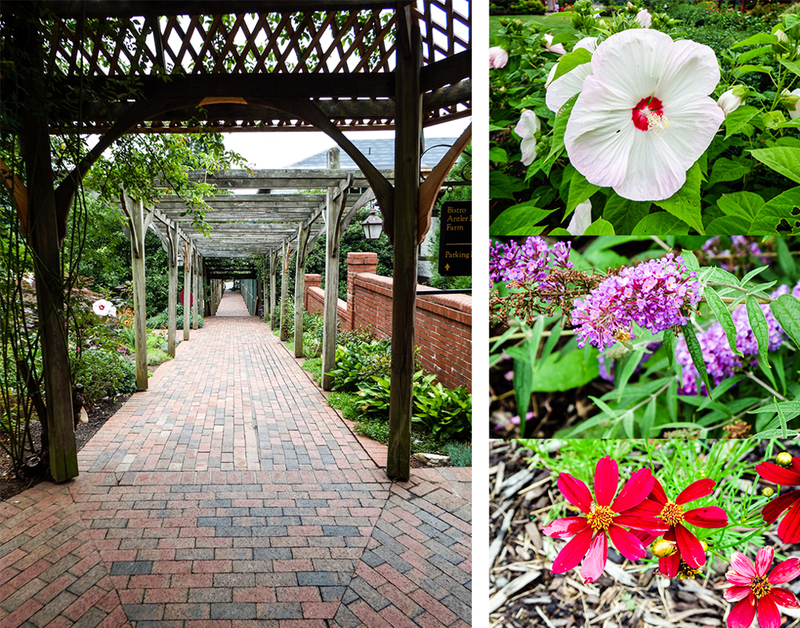 The gardens all around the estate are in impeccable condition. Even on a drizzly day, the purples, whites, reds, yellows were vibrant. Seriously…as my dying plants will attest to my own (lack of) skills…how do they do it?? 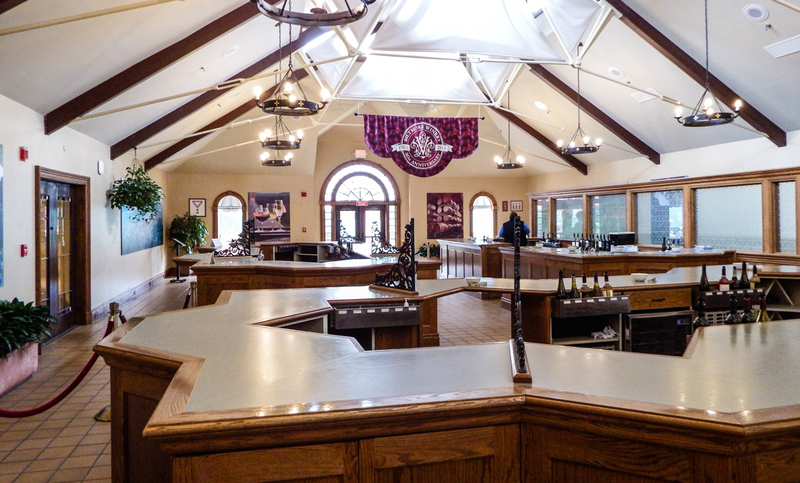 As soon as the winery doors opened, we headed straight for the tasting room. By the way they were preparing (setting up roped lines, opening up the overflow tasting room) it was clear they were expecting HUGE crowds (it was July 4th after all). But for us, I’m not going to say we were the first ones in the tasting room, but maybe the second and third. As always the wine was amazing. I don’t think any new wines were on the menu from the last time but I still enjoyed tasting all of my favorites and a few new ones that surprised me. Of course in our time at the counter, we saw not one, or two, or three groups come and go from our counter, but four. As I’ve mentioned before, most people try just one or two wines. I tried at least six and even a couple of sips from Ryan’s glasses. And this time at least two of the other groups had someone in the party who didn’t like wine. 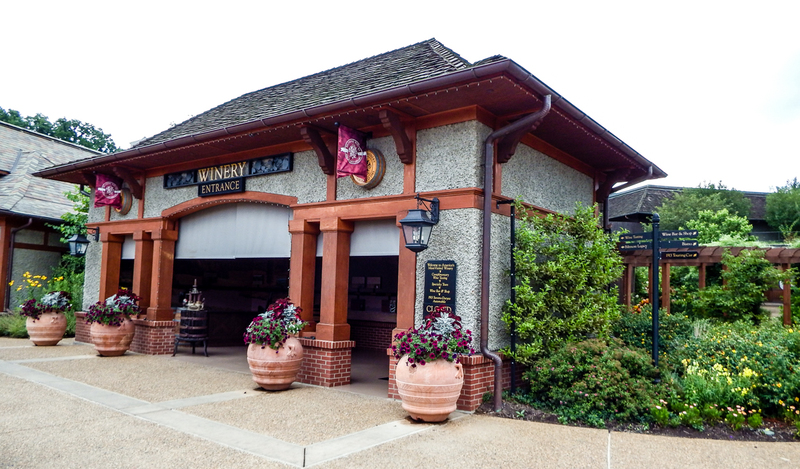 This is probably my biggest piece of advice – if you don’t like wine but still want to get your money’s worth, make sure to visit the winery early! You do not want to wait in line for an hour and then not enjoy the experience. Just hit up the winery first, try one or two to reaffirm your distaste (I do this with merlots every couple of years and yep, I still hate them), and then move on and use that hour somewhere else. Of course I recommend going to the winery first regardless but doubly so for people who are not that into wine. After we finished perusing the winery shop one last time, we headed over to the bistro to grab some lunch. The bistro can be pricey and the lunch prices skew more towards dinner prices but the food is fantastic. Since we had some time before our tour, we decided to give it a shot. 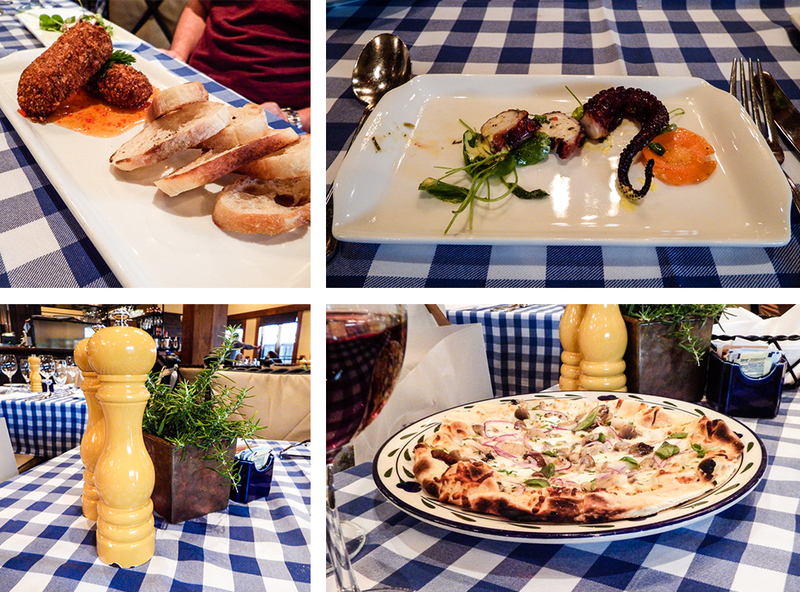 If you can eat lighter (and not order wine…though I did), then the prices are not so bad. We ordered two shared plates (octopus and fried brie) and a mushroom pizza to share. Mmmhmmm amazing. 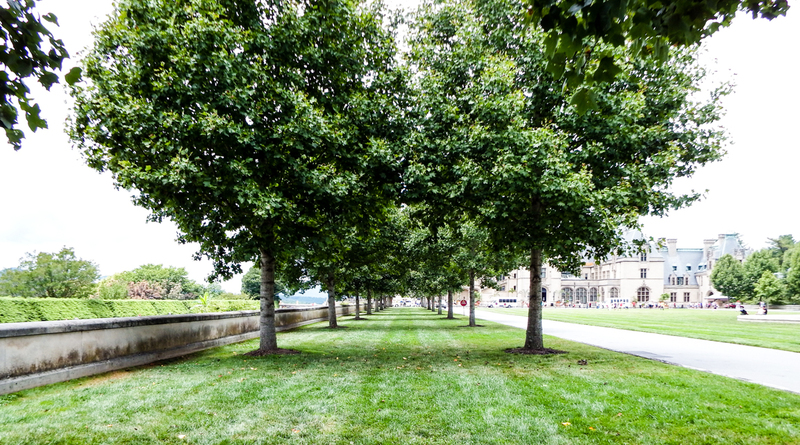 But onwards to the Biltmore House. Amazingly the traffic and crowds were not bad. We easily got a parking spot and the hordes in the lawn before the house were at a minimum. It only drizzled once but I think the threat of rainy weather kept the crowds at bay. 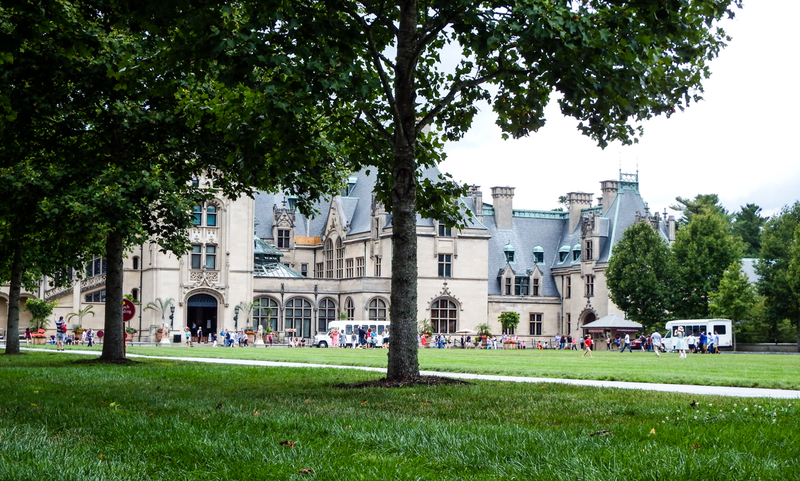 For our last visit to the Biltmore, we decided to do the Behind-the-Scenes Guided Upstairs – Downstairs Tour (formerly the Butler tour). The tour costs $17 and lasts an hour. With this tour you get to see the back balcony, the Butler’s domain, the sewing room, the lady’s maid room, the head housekeeper’s room, and then a suite of four guest rooms ranging from the North Tower to the South Tower. None of these rooms are on the regular tour of the house. So what did I think? Well…I’m glad I did it since I wanted to learn more about the house and its people. But at only an hour, the tour felt a bit rushed. We’d go to a new room and hear about the room’s functions, who worked/lived there, and then any stories about the person/room. The stories were the most interesting to me and I wish there would have been more of them. But at only 5 minutes per room, we couldn’t stay to linger and listen. Now I’m a fan of Downtown Abbey so I wanted to hear more about the servants’ lives and stories but that information has mostly been lost. Sometimes the names were known, sometimes not. Sometimes we had a story of how they left or where they went – a footman had to go to Arizona for his TB and one of the housekeeper’s opened a boarding house in Florida called the Biltmore Inn – but more often than not there are no records of these things. And that makes me sad. These were people with stories of their own to tell. But where the servant’s tales were few and far between, there are more records of the guests who stayed at the Biltmore house. There’s the story of Edith Vanderbilt’s sister who married for love and not money. Willy, George Vanderbilt’s best friend, who eventually married one of George’s nieces, after striking out with another one. And then there was Cornelia’s best friend. A girl so beloved by Edith and George that garden parties were thrown for her. In fact, she even restyled her maid of honor gown for Cornelia’s wedding when the one made for her was too short for her taste. 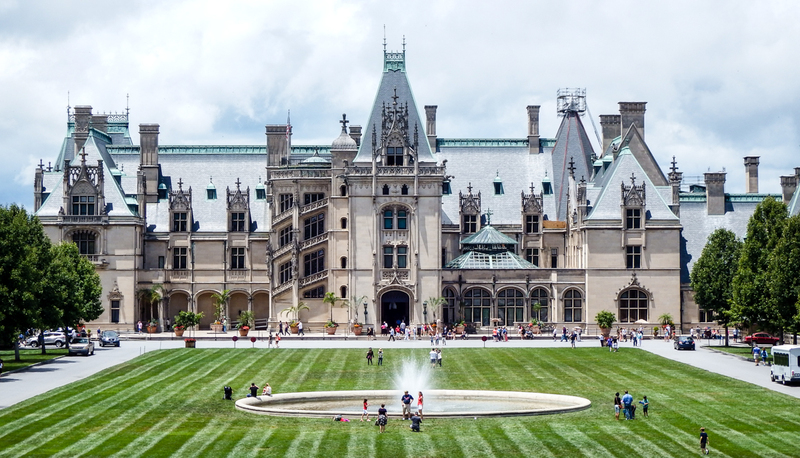 I hear these stories and I can begin to imagine what life was like at the Biltmore house. So was the tour worth it? It felt rushed and when it ended I was shocked it was already over. But I still liked it and I enjoyed learning more about the house and its people. So it’s a tough answer for me. If you finish the main tour of the house and want more, then go for it. But if you don’t find your mind wandering about what’s behind the closed doors, then maybe the $17 price tag isn’t worth it. After the tour ended, we wandered around the estate a bit more before heading back to the car. And I found myself turning back one more time to get a glimpse of the house before it disappeared behind the trees. Without a doubt, it’s North Carolina’s castle. Biltmore, I will miss you. Visiting Lisbon Castle. Amazing? Or Underwhelming?